His family has Sacramento in its DNA. He went to Sacramento State. His family’s “Filco” stores has been a part of Sacramento for decades. He’s ambitious, a formative salesman and for a brief moment, he was the prince of Sacramento. His project “The Towers on Capitol Mall with two, fifty three story condominiums would have changed the face of and quite possibly the image of Sacramento. This massive (500 million dollar) project would have been the most expensive in the city’s history. In contrast, the Golden 1 Center was less than 600 million. Before one support piling was shoved into the ground, one tower had completely sold out. Financing for the project collapsed and CalPers reportedly the giant lot at 3rd and Capitol. The collapse of the Capitol Tower, may have been a good thing for Saca. As the nations real estate market south, selling out the second tower and the rest of te complex would have been a challenge. Less ambitious projects in midtown struggled for years. In 2014, nearly seven years after the Capitol Towers project. John Saca said he would build the another Condominium/Hotel project at 10 the J Streets. “The Metropolitan” like the Capitol Towers project, would be the largest and tallest building of its kind in the city . The block on J Street between 10 and 11 is arguably the worst block in downtown Sacramento. As both sides of the street is filled with vacant boarded up buildings. One side of the street is Saca’s property on the other side is the former Copenhagen Furniture Store and several other closed and boarded up stores. Copenhagen closed after a fire in the ninties and relocated across town. Thirty to forty percent of first time visitors to Sacramento, travel down J street to the Convention Center or the Memorial Auditorium. Visitors staying at the popular Citizen Hotel pass by those empty boarded up buildings on route to the convention center. Finally, after more the twenty years, the city has said enough to the owners of those properties. Last week the City told Saca, he had until July to move forward with his project or he risks losing his rights to build on that site. In other words, he would have to start over and reapply. There are many of us rooting for John Saca, the local boy with a dream. A former Sacramentian, now living in San Diego resently said about her home town. 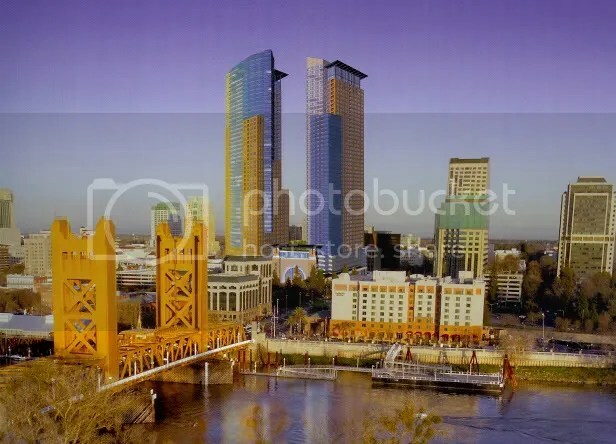 The tallest single use condominium in Sacramento is the 14 floor Capitol Towers built in the sixes. While there are several condo projects on the drawing boards, none are under construction. Including a smaller mixed used project on the site of former Saca project at third and Capital. Other cities similar in size to Sacramento have several projects in the sky. Our leaders in Sacramento, often get it wrong. They propose expanding a convention center that has never been profitable. Many cities planted seeds to get the first large projects off the ground. They saw the benefits of bringing empty nesters and the well healed back downtown. Sacramento’s leadership isn’t quite there.. While is original vision did not come to fruition. To his credit, Saca convinced quite few hundred people in a city with low aspirations. to share his vision. That says a lot about his abilities as a salesman. Despite his best efforts, he fouled out. Locating a lender willing to take a risk on a large project could be daunting. I am unashamedly a fan. There are a quite of few of us ,who wants the local guy to put his signature on Sacramento’s bleak skyline. To believe in Sacramento and people here. But, everyone starts from START. I hope he pushes ego aside and secure financing on a smaller project,say, 20 story condo on that site. If he is the salesman he was in 2006, he will have his sky shattering building in the sky in few years. The city will work with him, he still has few fans in high places in the city but they are waning. The Sac Bee reports, neither he or a representative attended the zoning meeting last week We are often judged is by our actions. Can he bring this project forward or is he man with dreams and renderings? This entry was posted in CITY VIEW, downtown, Living Here, observations, Politics, Real Estate, SACRAMENTO and tagged John Saca, Real Estate, Sacramento Ca, The City of Sacramento, The Metropolitan. Bookmark the permalink. ← RHOA: S10 Ep5 Jus Som Petty Mess!